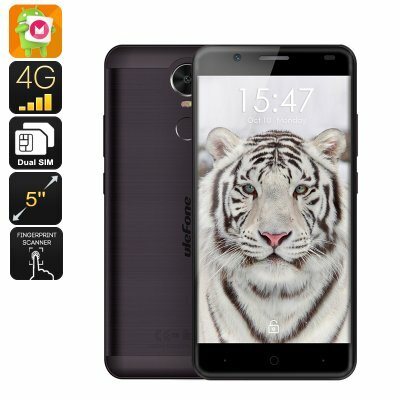 Successfully Added HK Warehouse Ulefone Tiger Smartphone - Quad Core CPU, 2GB RAM, Dual SIM, 4G, 5.5 Inch Screen (Black) to your Shopping Cart. A 1.3Ghz MTK chipset and 2GB of RAM means the cell phones performance isn't lacking when it comes to multitasking and it will handle games well thanks to the Mali-T720 GPU which takes care of all the graphic needs so you won't experience lag issues. There are 16GB of internal storage and with the micro SD card slot you can expand this with up to 128GB of additional space. A 5.5 inch display is a real treat as it makes this smartphone a phablet, and ensures that text is larger and easier to read as well as having the ability to fit more on the screen, so games and movies look fantastic. With 720P resolutions, this IPS screen really pops with brilliant colors that will make your media rich end vibrant. Dual SIM card slots are present on the Ulefone Tiger so you can utilize both SIMs at once and take control of two numbers simultaneously, the result is that you can be reached by work and personal contacts easily manage them all from the one device. With 4G connectivity, you will also be able to tap into the fastest cellular networks available that make it possible to stream HD movies direct to your phone. One of the common uses for a mobile phone is to snap and share photos, so if you keen on capturing the world around you the high-quality Sony IMX219 8MP rear camera delivers sharp pictures and can record HD video, perfect for sharing with family and friends. With its massive 4200mAh built-in Sony battery you will be able to chat for hours on end or watch movies galore with a fantastic usage time. The Ulefone Tiger Android smartphone come with 12 months warranty, brought to you by the leader in electronic devices as well as wholesale Android Phones..